More shells from the US airpower have fallen on the Islamic State group (IS) positions in Sirte over these past days as forces loyal to the UN-backed Government of National Accord (GNA) try to end the bout with the terrorist group. Airstrikes have doubled as of mid-October. Around 36 airstrikes were launched from Friday to Saturday on IS positions, bringing total number of airstrikes to 324 since August 1; the date the US joined the GNA’s counter-IS campaign launched in May. Since it arrived in capital Tripoli last March, GNA has placed the re-capture of Muammar Gaddafi’s hometown on top of its priorities. IS took control of the city last year driving out the militia protecting it. 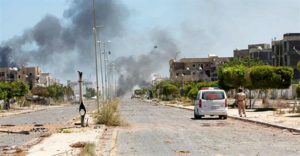 The terrorist group played on rivalries between Libyan factions to take over the town that it turned into a regional base outside Iraq and Syria. GNA forces, largely made of Misrata brigades, which were behind the fall of the Libyan ruler in 2011, have pushed the militants into their last retreat. The brigades announced they took control of the city’s Cambo area and cleared tunnels used by the militants to hide and prepare ambushes, Reuters reports. Now the forces are engaged in street to street fight to numb last IS snipers and suicide bombers. President Obama last month extended the campaign for another month. When it announced the beginning of the US air campaign in Libya, the Pentagon indicated it would take a “finite” period of time but resilience of the terrorist group has stunned US authorities. Loss of Sirte will mean a major setback for the terrorist group already in difficult situation in Iraq and Syria where international coalition have decimated the structure of the organization by killing major commanders. Posted by Geraldine Boechat on October 18, 2016. Filed under News. You can follow any responses to this entry through the RSS 2.0. You can skip to the end and leave a response. Pinging is currently not allowed.